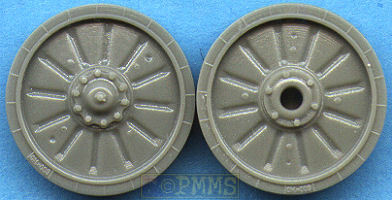 Master Club have released this set of resin replacement late road wheels and idler wheels designed for any BMP-1, -2 kits from Dragon, Esci or Zvezda. 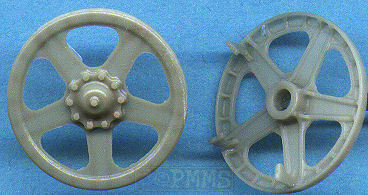 The set has 12 road wheels and the two idler wheels cast in light gray resin with the only clean being the usual casting blocks and some very fine resin film in the idler rim cut-outs, the casting blocks on the road wheels have already been snapped off for you leaving just a small scar to be sanded. You will have to take care removing the casting blocks from the idlers as these are quite fragile and need careful handling. The difference between the early and late BMP wheels is the central hub boss on the ealry wheels is circular but on the later wheels there are indents between each of the hub bolts for a subtle but noticable difference. There are also subtle differences in the wheel disc curve at the outer edge which is again not very noticable when looking at the wheels at normal distances. 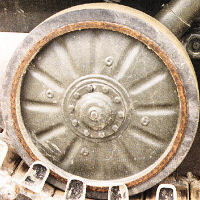 The wheels are cleanly cast wth details on both sides and the axle hole on the inner face as well as small ribs on the rubber sections, but in most pictures I have seen these are not present and it's easy enough to remove these if you wish. There are also very fine embossed numbers on the rubber sections to add additional detail and apart from the minor cleanup of the remaining casting blocks the wheels are ready to go. 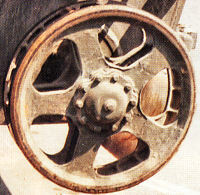 As with the road wheels the early idlers have circular hub bosses and the later type have the indentations between the bolts heads and there is also inner rib details and five connecting braces with none of these features included on any of the kit idlers. 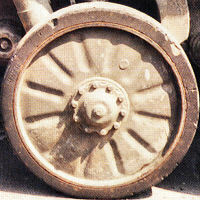 The detail on the two part idlers is excellent especially on the inside with the raised edges on the spokes and the ribs around the outer rim as well as the connecting braces which sees three on the inner wheel and two on the outer wheel. These braces are quite delicate and care is needed when handling with two broken off my wheels in transit but as the broken parts were still in the plastic bag it was easy to glue them back into place. 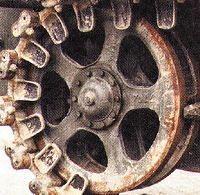 There are small indentations on the opposite rim to locate the braces when the two idler halves are fitted together and this made for a very precise fit ensuring the spokes also line up correctly with the final idler wheels having excellent details but it's a shame most of the inner rim detail is not that easy to see after the wheels are assembled. A simple yet superbly detailed set of late road wheels and idlers for any of the available BMP1, 2 kits with only minor cleanup on the road wheels with the idlers wheels a standout feature having excellent inner rim detail and the connecting braces. These wheels are only applicable to later BMPs so you should check references to see if they are applicable and all we need now is a new generation BMP 1/2 kit to match the detail on these wheels.